Singapore MTM Curtains offered many kinds of materials. Some examples are motorized curtains, hospital curtains, day curtain, night curtain, eyelet curtains, dim out curtains and blackout curtains. Curtains Singapore such as Singapore MTM Curtains is a local registered company that offers all kinds of window furnishing for you. From curtains, to blinds, windows to window grills or even frosted to solar films. We also provide carpet tiles. Registered as a sole proprietor in Singapore, everything is liable to the Director and not the company. Therefore, do not be worry what will happen when the company wind down. Liability is to us, not the company. Even company wind down, we are held responsible for that. Materials is QC and imported from countries internationally such as Korea, USA, Taiwan, Turkey and India. Therefore it takes work and effort to provide quality materials for our customers. Curtains have been a main majority in window furnishing since long decades ago. As a result, it always provides a cozy and homely ambiance to the surroundings. Furthermore, most of our curtains come in many different designs including designs for kids too. For your information, we have listed a few types of curtains materials in Singapore for you to understand even more about the usage. Above all, you may read more on our news & tips page! Likewise to a Sheer Curtains, is a type of thin layer being translucent, similar to organza kind of materials. In contrast to the day curtains, professionally known as night curtains or standard curtains. They are the most commonly used in many households. Similarly to a night curtains, the materials are thicker as it is 3 layered based. Giving a better blockage of sunlight from 80% to about 90%. Blacked-out materials is the thickest of all, it usually contains an extra layered of latex which can efficiently block out 100% of sunlight. Curtains Singapore have all you need here. We customize and made-to-measure to your needs. It is a lot of knowledge from selecting the kind of tracks and hooks, curtains materials, design to suit your homes and we have our professionals here to help you in deciding the most suitable, ideal curtains here! What are you waiting for? Do also visit our portfolio to view our past projects. If you have anything in mind, or you will want to discuss with someone, kindly give our friendly consultant a call (click here to contact us) today! We will be glad to serve you with our best ability. 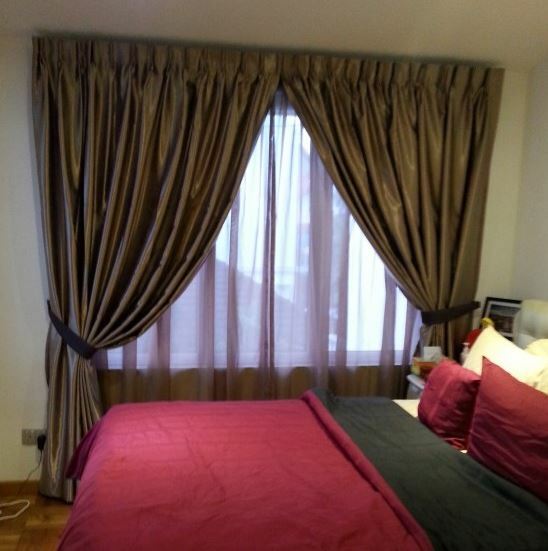 At Singapore MTM Curtains, we made-to-measure to your needs!